I’ll tell you right from the beginning that I’m very biased when it comes to Star Trek. Full disclosure: I’m a fan since many years, holding Captain Picard and TNG as my favourite. I love everything about the franchise – even the inevitable bad episodes that appear once or twice every season when they’ve run out of money and spend the entire episode playing poker in the holodeck because it’s cheap. Star Trek can basically never go wrong. On the other hand I’m not a fanatic. I don’t call myself a trekkie and I don’t go to Star Trek conventions dressed up as a Star Fleet member. I don’t consider the original series or anything else that has been done in the past a sacred territory and I don’t automatically think that older is better. I love what they did with the 2009 reboot. The tempering with timelines was a smart thing to do to provide more freedom. I thought the changes were well judged and necessary to introduce Star Trek once again to a new, modern audience. I tell you all of this so you know what kind of post this will be. If you’re not into Star Trek at all, you might find my enthusiasm inexplicable. And if you’re a die-hard trekkie of the more conservative sort, you might sneer at how willingly I buy into all the new stuff. The blasphemy! As so often is the case with science fiction movies, I’ll be very vague about the story. I realize that many of you, if not everyone, already know who the villain is. But maybe someone doesn’t, and I certainly don’t want to be the one to spoil it. So let’s just say that we once again meet Kirk, Spock and the rest of the Enterprise family, not all that long after the last movie finished. They’re still young and inexperienced, still learning from trial and error, still trying to figure out how to handle the star fleet regulations as well as their inner morale compasses, as they’re pointing them in different directions. 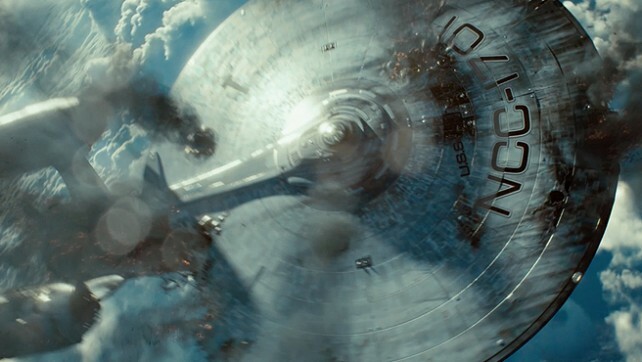 This collision between rules and ethics has always been a present theme in Star Trek and is one of the elements that make the modern movies feel like they tie into the tradition, even if they have a different look and pacing. The elastic outfits of the crew vary in colour and shape, and the budget for make-up of alien species give different results over time. But beneath the surface, it’s the same question that keeps coming back: what does it mean to be human and what makes us different to machines and truly alien aliens? The way to approach this is to let someone – a man, a woman, a Vulcan or an android – face an ethical dilemma, where the key to success always is to think “outside of the box”, to free your mind from prejudices and be willing to see things from different perspectives, not necessarily in compliance with the rules. Another typical Star Trek feature, also present here, is the humour, the funny one-liners, verbal jabbing between the crew members, delivered with a straight face or a raised eye-brow. Because of this, Star Trek never will get genuinely dark. It’s just not in its DNA to be that, and frankly I don’t know who they’re trying to kid with the title and marketing. “Into Darkness”? No way! The darkest moment I can recall of Star Trek was when Captain Picard for a while was incorporated into the Borg. But not even then would I call Star Trek “dark”. If nothing else, the optimistic signatures to all the TV series give it all away. We know that humanity will win over evil in the end, the question isn’t “if”, but “how”. It’s in the nature of Star Trek to remain hopeful, always looking for a solution, no matter what challenge they’re facing on their mission in space. And speaking of this, this is the one thing that I find lacking in the movie if you compare it to the TV series: the sense of exploration. For me Star Trek was always about being on a big adventure, boldly travelling a never-ending space to new worlds for scientific reasons, and apart from the opening scene, this is missing. Actually someone even drops a remark early in the movie about research being replaced by war and shouldn’t we head out for a 5-year mission? There’s no seeking out new life forms, no time travelling, no communicating with creatures beyond what a human can grasp and nothing of the fun messing around with time and space continuum that always made for the best episodes. This movie mostly about fighting, with any mean you can find – star ships, laser guns or – if you don’t have anything else at hands – fists. On the other hand, this is not unique. It seems to me that the films often have been more focused on protecting Earth against various threats, while the mind-bending ideas and the expeditions to far distant galaxies have been left for the TV series to deal with. However this absence of exploration, both of space and of bigger, philosophical ideas, is what keeps me from giving it a 5/5. I would have loved to have my brain tickled just a little bit more to be completely satisfied. « Pedophilia accusations against an actor – reason not to show a movie? Like you, my favorite Star Trek are the TNG days. I love Picard and company, both the series and the four films. 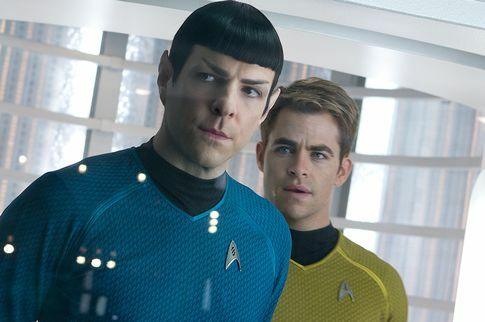 But I may be one of the only people on the planet who wasn’t just blown away by the more recent Star Trek reboot. I did recently rewatch it and review it and had a little bit better experience with it which has me now excited to see Into Darkness. It’s really good to see all of the high marks it is getting from those who have seen it. It opens here Thursday so I’ll be checking it out soon. I’m sorry you weren’t blown away. I rewatched Star Trek from 2009 as a preparation for watching this one (taking it pretty seriously since I’m going to be on a LAMBcast show talking about it), and I loved it just as much as I did first time. Anyway: I’m glad you’re still excited. Looking at the ratings I’ve seen so far it seems that it’s getting a mixed reception. I’m one of the lovers. I hope you’ll turn out to be that too, even though I doubt it a little since you weren’t into the reboot in the first place. In last week’s review I talked about a few things that I initially had problems with the first time around. It mainly had to do with the tone which felt jarringly unlike Star Trek to me. The redefining of certain characters and the Hollywoodizing of the film never felt right. BUT, while I still have the same concerns, I’m happy to say that last week’s viewing made those things much less of an issue. If you get a chance check out my review. I would love to hear your thoughts especially since you’re a fellow TNG fan. I NEVER get tired of those shows! I’ve just commented on it. I don’t agree that the spirit of Star Trek is lost in the reboot. I think it’s still there. I got started with the TNG days, but I think I really fell in love with the show during the DS9 days. I think I enjoyed the extra diversity with the characters on DS9 as well as the overarcing plotline. I can’t wait to see the movie and am so glad I actually won free tickets because my budget is really limiting my theater-going. DS9 is actually the only series that I haven’t watched all that much. There was something about its stationary nature, similar to Babylon 5, that put me off a little. But I’d love to give it a new chance. My second favourite after TNG is probably Voyager. I think Captain Janeway is great, a huge step forward in terms of equality for the sci-fi TV genre. I hope you’re going to love this movie as much as I do! Thanks Fernando! It was a fun and exciting experience indeed. And not particularly dark. Yes, yes, I agree with everthing you write. I’m also a huge Star Trek fan. Maybe we are not trekkies but trekkers? 😉 The only show that I haven’t watched fully is Enterprise. Something put me off with that series. Maybe the title seqeunce, haha. And yes the darkness in this movie isn’t really dark but rather funny and bright. Oh, yes, I liked the callbacks to the old series episodes and films. I’m one of the very few who actually liked Enterprise and disapproved of its quick disappearance. The signature was a bit of a shocker to begin with, like some cheesy ad for sports equipment that felt out of place. But that was just my gut reaction. As time went by I got more and more fond of it until I was a fan. True story! Don’t have me explain why because I can’t. It feels so weird to see a movie before US. Since very few in blogging community have seen it, it feels so quiet. Not a lot of comments, not a lot of posts, not a lot of discussion at all. I’m curious to see how it will be received when US wakes up. I am a casual Trek fan (loved ‘The Wrath of Kahn’ and ‘First Contact” and knows what a “tribble” is without googling). I saw this today upon opening here in the U.S. and articulated my own review. While it was certainly fun, I had two problems with ‘Star Trek Into Darkness’: (1) how tightly the film is tied to the narratives and tropes of the original franchise, even for an alternate timeline; and (2) how a lot of the drama and “stakes” fell flat due to solutions to those career-ending/life-ending circumstances that were telegraphed earlier in the film. It’s hard to articulate further without going into spoilers. I think the stakes are always low in one way in Star Trek since you pretty much know you’ll end up in a good place eventually (even if you might have to wait until the next movie or episode in some cases). It’s just not a dark franchise. If the tie to the original is an asset or a problem can be discussed. I liked it. But I’ll head over to your place and check out your take. Great write up! I have to echo your sentiments. It’s been a while since I’ve seen the past films so the call backs to earlier entries were lost on me. However it still didn’t hurt my enjoyment of this film. Fully entertaining. I was reverted throughout!! Thanks! I recommend you to go back and check out the TV episode and movie that this film ties into. I watched them afterwards and it was great and made me appreciate the new film even more. I’d like to see them set off to explore more, too, Jessica. That would be great if the third film had that kind of focus! I’m not the hugest fan of Cumberbatch here though (many people have been calling me out on it) He was just kind of there and angry 😦 I want a little more charm in my villains! Anyway: I’m glad you overall enjoyed it! Great review, I completely agree that Star Trek never really was supposed to be that dark and that the lack of that titylar “Darkness” here wasn’t that big of a problem for me. My only comment would be that while exploration works great from a television point of view, it’s hard to justify having it be the center of a movie that takes three to four years to make. Now, if they could fill the four years in between films with a television season or two based on the less-explosive exploration episodes, that’s something I’d sign up for in an instant!